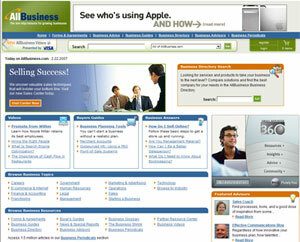 AllBusiness.com is an online media and e-commerce company focused on the small business market. 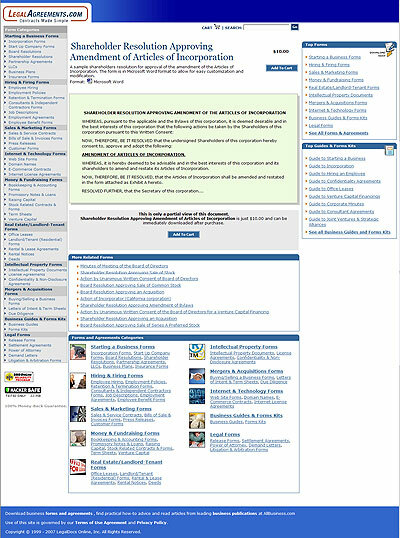 As a web developer, I participated in a soup-to-nuts redesign of this large and venerable site (it was started in 1999 and had tons of content and legacy architecture), and helped turn it into the dynamic, standards-compatible, Web 2.0 site it is today. The redesigned site is served using a proprietary Content Management Server or CMS. In addition to actually helping build the site as part of a team of two, I also spec-ed it out, delivering html/css specifications to the engineering team for them to use in building the components that comprise the site. Post-launch, my responsibilities include general site maintainence, troubleshooting, and development of new components. I have built a number of cobrand sites (sites in a partner's domain that contain AllBusiness content) and microsites (pages on AllBusiness dedicated to partner content). Clients include companies such as The Washington Post, CBS News, LegalAgreements.com, Comcast, Hewlett-Packard and Citrix. These revenue generating sites are built in the CMS under tight deadlines and exacting designs. Legalagreements.com is an example of an ecommerce partner site. It uses standards-compliant HTML/CSS and a fluid design.